Walk down Nakamise Dori or Nakamise Shopping Street, a traditional Japanese shopping street in Asakusa that starts at Kaminarimon and leads to Sensoji Temple. Learn what shop for and how to find Japanese street food and sweets like ningyo yaki. Nakamise Street (Nakamise dori) is a lively traditional shopping street that runs from the iconic Kaminarimon gate right up to Tokyo's prestigious Sensoji Temple. The street is thought to have been founded during either the Kyoho era (1716-1736) or the Genroku era (1688-1704). This makes it one of Japan's oldest shopping arcades. These days, around 89 stores are lined up along the 250-meter long strip, transforming this street into a shopping spot ideal for finding Japanese gifts and traditional souvenirs in Asakusa. One staple souvenir to look for is the highly sought after maneki neko (cat figurines that are said to bring good luck). They are placed inside or in front of commercial establishments in order to bring in customers. Their raised paws symbolize the act of calling customers into the store. As you can see, a multitude of this feline line the shelves of this doll shop. Be the envy of your friends by putting on one of these reasonably-priced kimonos and wandering through the streets of the old district of Asakusa! You will also have fun perusing over these Japanese swords and other Japanese traditional items. Asakusa's Nakamise Dori is particularly known for its delicious Japanese senbei and kibi dango (bottom picture from Asakusa Guide: Sensoji Temple, Nakamise-dori, Tokyo Skytree and More!). Feeling slightly peckish? There are many food stalls along Nakamise Dori to satisfy visitors' hunger. You will find plenty of freshly made traditional Japanese snacks, such as senbei (rice crackers), kibi-dango (sweet dumplings made of sticky soft rice flour), and age-manju (fried buns with a sweet bean paste filling) are on sale at various shops! With so many options to try, it may be hard to decide which to eat. Another must-try food is ningyo yaki, a cooked pastry made into different shapes, such as dolls and birds. The inside is filled with sweet red bean paste. This is a famous confection in Asakusa. You can even see the pastries being made--look for workers filling cast iron-molds with the light batter. It is also good to mention that you will enjoy a wonderful view of Tokyo Skytree from this position, so don't forget to take a look! You can capture a stunning photo from this area. Nakamise Street after sunset is also a must-see. Experience a quieter, calmer and alluring side, as opposed to the daytime hustle and bustle. Look out for the shop shutters, which are decorated with various seasonal depictions of Asakusa. Nakamise Dori starts right behind Sensoji Temple's iconic Kaminarimon, making it easy to find. Therefore, if you follow directions to get to Sensoji Temple you will arrive at Nakamise Dori and be able to walk through it. The way to get to Nakamise Dori depends on which station you exit from. There are four stations in Asakusa: the station for Tokyo Metro Ginza Line, the station for Toei Subway Asakusa Line, Tobu Asakusa Station, and Tsukuba Express Asakusa Station. In particular, the Ginza Line, Asakusa Line, and Tobu station are close to Nakamise Dori. At the station, use exits A3, A4, or A5 and look for signs for Sensoji Temple. 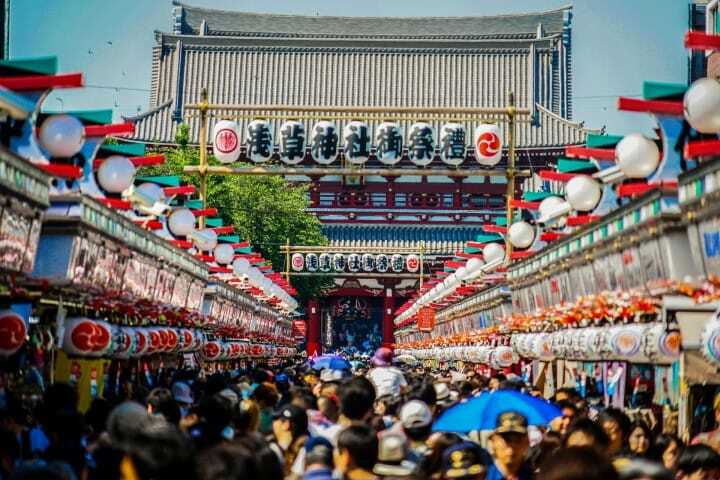 If it's your first time visiting the Asakusa area, then the Nakamise shopping street should definitely top your list of places to go. The amount of things to do, souvenirs, food, and sightseeing opportunities here provide hours of fun. Come and experience hundreds of years of tradition in the middle of Tokyo! Shopping in Asakusa: 3 Recommended Umbrellas at "WAKEARI HONPO"